If you think creatively, you can wow potential customers and long-term clients with a gift or perk. 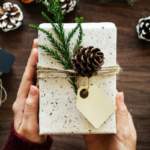 Here are tips for your holiday gifting strategy. Traveling for business? Check out our tips to avoid boring business trip habits and make the most of your next conference or meeting.